This time I somehow managed to rid of them or simply they just got bored eating the same thing for weeks and left. Either way, as I was plucking the leaves off my beautiful plant I thought the best way to use them would be to have them fresh – unspoilt by cooking, with some gorgeous French walnut oil, in a pesto! While the pasta can be enjoyed warm straight after cooking, it also makes for a lovely summer salad when chilled, making it a great candidate for a lunchbox. Tip: Sundried or cherry tomatoes go just as well with this dish if you prefer a vegetarian version. To make pesto, place basil, crushed garlic and salt in a mortar and pestle or a small food processor and grind until it resembles a paste. Add pine nuts, crush then mix in with oil and grated cheese. Season with pepper to taste. To make the pasta, boil penne according to packet instructions (generally drop pasta into a pot of salted boiling water and cook for 10-12 minutes. Then drain and rinse with cold water to stop the cooking process). In the meantime, pick meat off the quarter chicken and chop roughly, discard skin and bones. Slice zucchini and ‘chargrill’ lightly in a small frypan along with the broccoli. 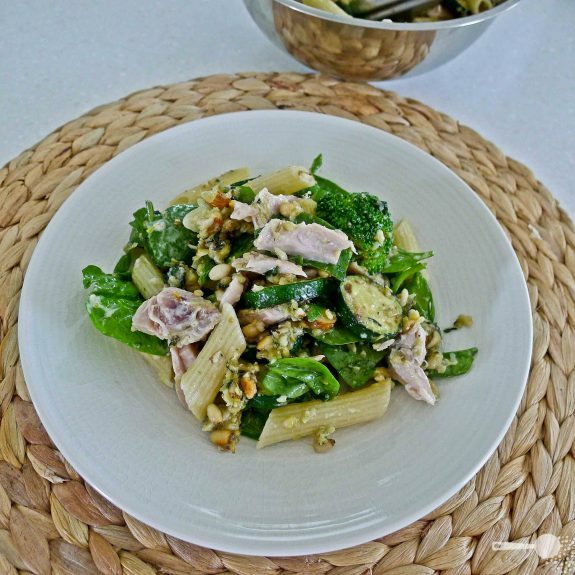 Combine pesto, fresh baby spinach leaves, grilled zucchini and chicken with pasta and stir well to coat. Add a squeeze of lemon juice. Serve warm or chilled as a salad.